I've decided to try to offer listings of literary events across Asia, excluding West Asia / The Middle East, but extending west to east from the Indian Sub-continent to Japan, and north to south from Mongolia to the southern tip of the Indonesian archipelago. For a series or a course of events at one venue, or for literary festivals at multiple venues within one general area, please supply the start and finish dates. For literary festivals, I will give only the over-arching venue, e.g. Jaipur, Hong Kong, or wherever. I have also decided to launch a book club. I will select a book at the beginning of each month, and request that people post comments through the month. I will then summarise these at the end of the month, plus give my own thoughts. My first book club selection, for September, is Crazy Rich Asians, by Kevin Kwan, a comedy about three super-rich Chinese families and the gossip, backbiting, and scheming that occur when the heir to one of the most massive fortunes in Asia brings home his American Born Chinese girlfriend. When Rachel Chu agrees to spend the summer in Singapore with Nicholas Young, she envisions a humble family home, long drives to explore the island, and quality time with the man she might one day marry. What she doesn't know is that Nick's family home looks like a palace, that she'll ride in more private planes than cars, and that with one of Asia's most eligible bachelors on her arm, she might as well have a target on her back. Initiated into a world of dynastic splendor, Rachel meets Astrid, the It Girl of Singapore society; Eddie, whose family practically lives in the pages of the Hong Kong socialite magazines; and Eleanor, Nick's formidable mother, a woman who has very strong feelings about who her son should - and should not - marry. Crazy Rich Asians is an insider's look at the Asian JetSet; a depiction of the clash between old money and new; between Overseas Chinese and Mainland Chinese. 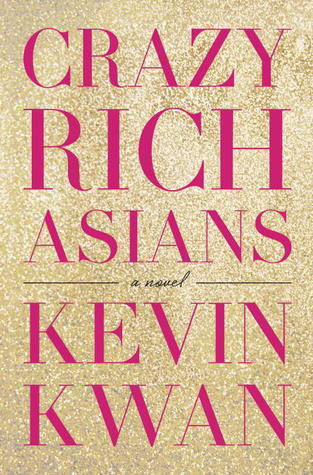 Crazy Rich Asians is published by Doubleday, in hardback, paperback, audio, and e-book formats. Color Force has acquired movie rights so it should be coming to a big screen near you sometime soon. So: what do you think? Please do post with your opinions, and I'll share mine at the end of the month.